Duterte, Escudero top November 2015 Pulse Asia survey on Metro Manila - Balita Boss! Davao City Mayor Rodrigo Duterte and Sen. Francis Escudero topped the November 2015 Pulse Asia presidential and vice-presidential preference survey conducted in Metro Manila on November 11 and 12. 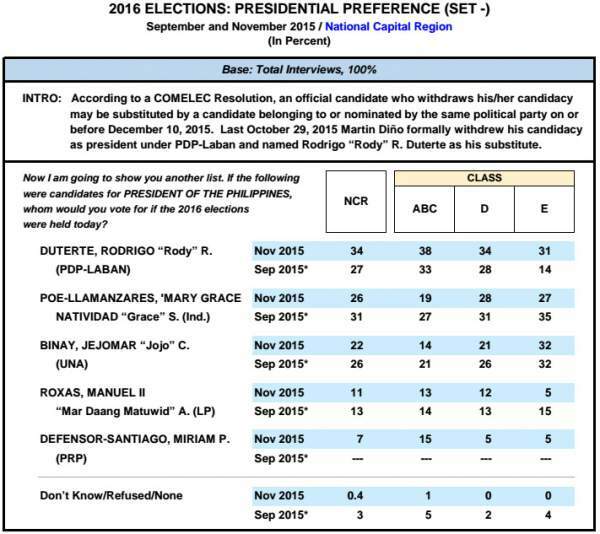 According to a news report of ABS-CBNnews.com, Duterte is now leading the latest Pulse Asia survey on presidential aspirants with 34% of the 300 respondents’. 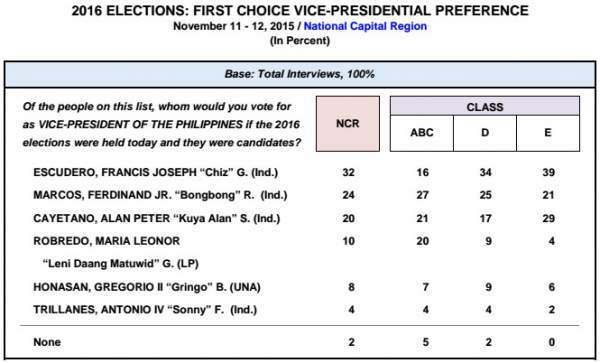 Senator Grace Poe followed second with 26%. For vice-presidential candidate, Escudero emerged on top who got 32% for Metro Manila respondents. He is followed by Sen. Ferdinand Marcos Jr. with 24%. "If the following were candidates for PRESIDENT OF THE PHILIPPINES, whom would you vote for if the 2016 elections were held today?" "Whom would you vote for as VICE-PRESIDENT OF THE PHILIPPINES if the 2016 elections were held today and they were candidates?" Davao City Mayor Rodrigo Duterte is planning to file his certificate of candidacy (COC) for president at the last minute. In an interview during his arrival at the Davao International Airport Thursday evening (November 26) Duterte said that he would file his COC as substitute candidate for president under the PDP-Laban on December 10 – the last day of filing for substitution. Continue reading on CNNPhilippines.com. Public opinion polls, like the latest Pulse Asia survey of presidential candidate preferences among Metro Manila voters, “serve to heighten people’s interest in the electoral process,” according to Malacañang. Presidential Communications Secretary Herminio Coloma said such surveys “encourage our people to broaden their participation by learning more about the platforms of candidates and assessing their records in public service.” Continue reading on Inquirer.net. The recent Pulse Asia survey which showed Davao City Mayor Rodrigo Duterte is the leading candidate for president in Metro Manila is inconclusive, the camp of Sen. Grace Poe said yesterday. “There is more to the Philippines than Metro Manila… it is inconclusive and not reflective of the sentiments of the country,” Poe’s spokesman Valenzuela Mayor Rex Gatchalian said. Continue reading on PhilStar.com.